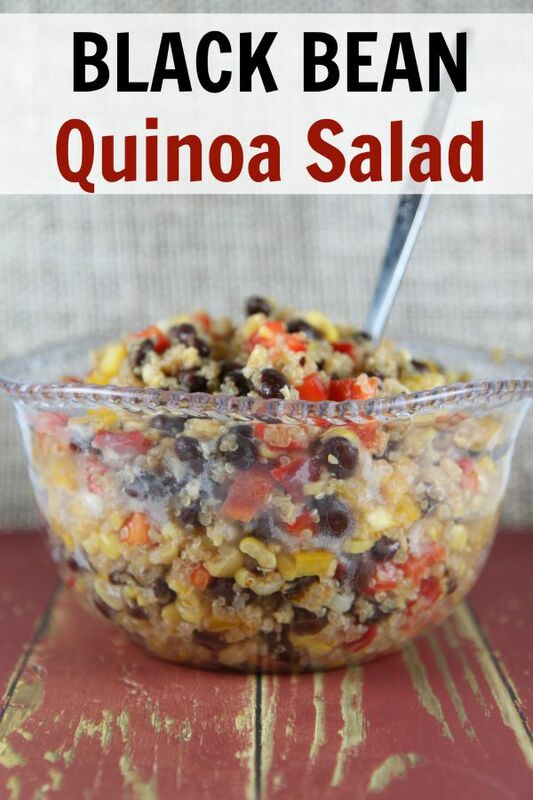 Quinoa has been called a superfood and it’s one of my favorites! It is a complete protein and is also a good source of dietary fiber, phosphorus, magnesium, and iron. 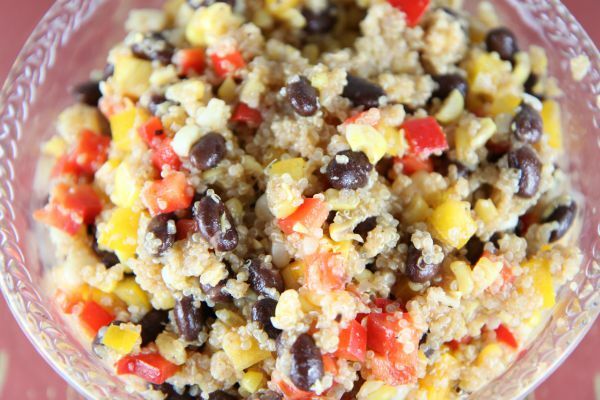 For those of you that are gluten-free, you know that you can enjoy this gluten-free “grain.” This recipe can easily be a gluten-free recipe as long as you pay attention to the label of the canned beans and apple cider vinegar that you use. The first time I had this particular recipe, my aunt had made it for us while we were visiting her in Florida. She wanted a side dish that the vegetarians could enjoy. I’m pretty sure everyone who ate it enjoyed it and it is evident at my house that this is a popular recipe. 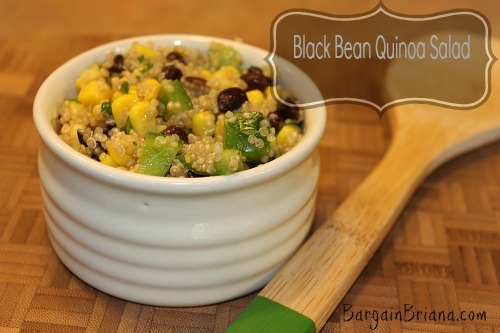 Use as a side dish or you can add it to a salad and top with salmon for a delicious dinner. I have already made numerous batches of this recipe since I got my hands on her recipe. I have cilantro in my garden that is ready so I don’t have to try to track this down at my local grocery store. This recipe is good cold or hot. Either way is absolutely delicious! I’ve also substituted red and yellow bell peppers for the green bell peppers. FASTer Way to Fat Loss® program! See how I lost 50 pounds in 6 months here! Bring water to a boil. Then stir in the quinoa. Return to a boil. Then reduce to a simmer, cover and cook for approximately 25-30 minutes. Whisk the vinegar and oil together in a small bowl while the quinoa is cooking. After combined, add lime juice, salt, and cumin and blend. 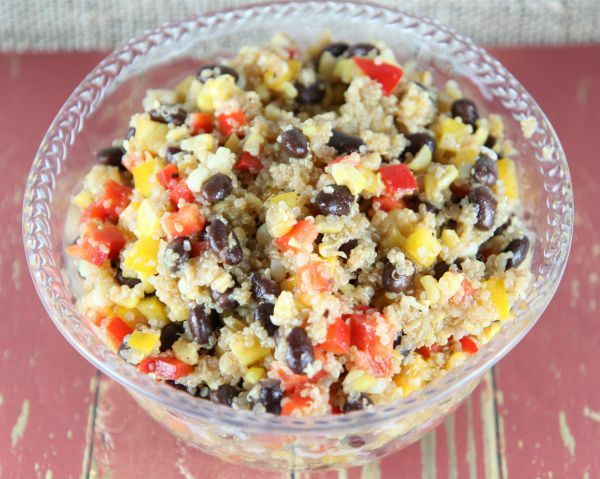 Add quinoa to a serving bowl, then add in beans, corn, bell pepper, and cilantro. Combine the vinaigrette dressing with the mixture and stir until all is coated. I love this, we eat it often in our home. I am wondering the nutritional information though. Any idea? This is an amazing salad and turned out perfectly. I cut back on the salt because of what I read, but I found I had to add more salt when it was done. I’m going to grill up some chicken and add some for a nice, healthy dinner. Loved this recipe. However, I only used 1/2 tsp salt and 1/2 tsp cumin. Even with those changes, seemed a tad too salty. Will adjust the salt (maybe 1/4 tsp?) next time. Great overall recipe though – thank you Briana!!! I made the dressing as posted, but found it way too salty, and I like salt. Ended doubling the other dressing ingredients and adding about 2 tablespoons of honey. Added a thinly sliced kale to salad and roasted corn before adding to salad. Salad lasts for a couple days in the fridge. thoughts on combining red and white wine vinegar instead of the apple cider vinegar to make the dressing? Can I used canned kernal corn for this recipe? Also do you know more or less have many calories per serving and what how much is a serving? Thank you! I am looking forward to making this as part of my meal prep. Yes you could. Just drain and rinse first! You will most likely have a little more sodium but I believe the nutrients should stay the same. Thank you. Do you know how many calories are in a serving? And how much is a serving? This looks absolutely delish! I just had a wrap with quinoa, guacamole, turkey, mozzarella, salsa etc. This would have been great to add to the wrap, already pre-made!!! Love it. Thanks for sharing! If you divide into 8 servings, it would be 7 points per serving!